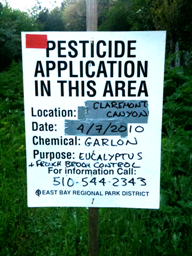 Garlon is one of the two pesticides that UCSF proposed to use to prevent re-sprouting of felled eucalyptus, blackberry and vines. It is regularly used on Twin Peaks, one of the highest points in the city. We should mention that on Mount Sutro, UCSF is currently using no herbicides at all. Neither is the Marin Municipal Water District, and it’s easy to understand why. Someone sent me the chapter on Garlon from the Marin Municipal Water District (MMWD) draft Vegetation Management Plan. (You can read that here:Chap4_Triclopyr_8_27_08 ) It was a pretty thorough multi-source review of what was known about the chemical, and it clarified the risks: birth defects; kidney damage; liver damage; damage to the blood. What stood out, though, was how much is not known, particularly about the effects of repeated low-level exposure. There simply isn’t that much research out there, and few human studies. “Although triclopyr has been registered in the US since 1979, there are still very few studies on triclopyr that are not part of the EPA registration process.” Most of the research that exists is on Garlon 4. What is used on Twin Peaks is Garlon 4 Ultra. It’s similar but isn’t mixed in kerosine. It’s mixed in a less flammable but apparently equally toxic methylated seed oil. Garlon “causes severe birth defects in rats at relatively low levels of exposure.” The rats were born with brains outside their skulls, or without eyelids. “Maternal toxicity was high” and exposed rats also had more failed pregnancies. 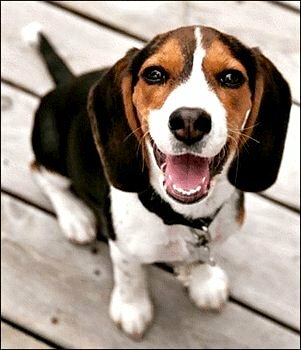 Rat and dog studies showed damage to the kidneys, the liver, and the blood. It’s insidious, because there’s no immediate effect that’s apparent. If someone’s being poisoned, they wouldn’t even know it. In a study on six Shetland ponies, high doses killed two ponies in a week, and two others were destroyed. It isn’t considered a carcinogen under today’s more lenient guidelines, but would have been one under the stricter 1986 guidelines. There was insufficient information about Garlon’s potential effect on the immune system, or as an endocrine disruptor. It very probably alters soil biology. “There is little information on the toxicity of triclopyr to terrestrial microorganisms. Garlon 4 can inhibit growth in the mycorrhizal fungi…” (These are funguses in the soil that help plant nutrition.) No one knows what it does to soil microbes, because it hasn’t been studied. Given all the information we do have on this chemical (and all the information we don’t have ) we have to question why native plant restoration is worth spraying poisons on some of the highest points in our city. Garlon must be used when the weather is wet; if the plants don’t have water, they will not grow and the chemical won’t work. But the runoff from these hills is enormous during the rain – it washes down in rivulets and streams, and it will end in the reservoirs, the groundwater, and the bay. Garlon notices were up on Twin Peaks for most of March 2010. We also question whether it even achieves the the nativists’ objective. On Twin Peaks, it’s targeted at oxalis, but Garlon is not a precision instrument. It will kill all broadleafed plants, native or otherwise, and favor grasses. Over time, Garlon use will convert Twin Peaks to non-native grasses (because those grow faster than native ones). We can only speculate what it does to resident insect populations, because there’s no data. No ant studies. No caterpillar studies. No Mission Blue Butterfly studies, despite its use in a Mission Blue Butterfly area. The only studies show that adult honeybees aren’t being immediately killed. Long-term hive studies? None of those, either. Meanwhile, the soil chemistry is probably being altered, and a regular dose of toxins added to our watershed in our “Native areas.” We have no idea whether there’s a particular risk to dogs being walked in Garlon-sprayed areas, or to pregnant women there or in the homes below the Garlon-sprayed hills. Based on the current levels of research and information, we’d guess that San Francisco’s Recs and Parks has no idea either. This entry was posted in Environment, eucalyptus, Herbicides, Herbicides: Roundup, Garlon, nativism and tagged Garlon, herbicide, native plants, nativism, Sutro Forest, Twin Peaks. Bookmark the permalink. The application of Garlon at doses replicating typical rates of ingestion, “weight loss and decreased reproductive success in birds” was found. Mycorrhizal fungi killed by Garlon are found in the roots of eucalypts and are essential to the health of oaks. The MMWD risk assessment suggests a need for further research to determine the effect on populations of oaks. In other words, while attempting to benefit the native oaks, it is probable that they are only being harmed by the poisons used to eradicate eucalypts. 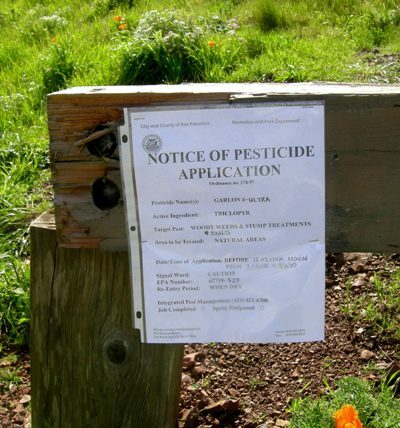 The poisoning of the “natural areas” in San Francisco is occurring in a city that has officially adopted the Precautionary Principle. The PP obligates the city to prohibit the use of materials that are suspected of having harmful effects on the environment, on humans, on animals. Clearly there is sufficient evidence to ban the use of Garlon in San Francisco. What’s preventing the Department of the Environment from taking action on this dangerous chemical? Hard to believe this kind of thing is still going on in 2010. And in San Francisco – supposedly a green, hip city. I hope eventually common sense will prevail over the greediness of chemical companies and cults. Time and time again our abuse and overuse of things has nasty ramifications we do not anticipate or understand before it is too late and damage is done, sometimes irreparable – there is no doubt that when it comes to the survival of ecosystems and the health of species (including us) the ‘better safe then sorry’ approach should be taken. 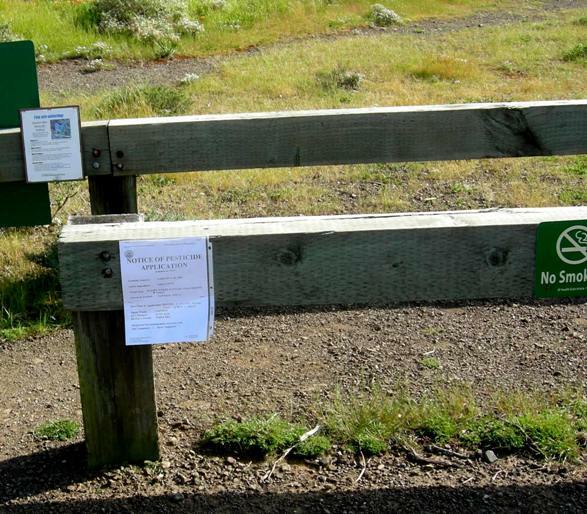 The use of herbicides on Twin Peaks, and the planned use on Mt Sutro, is truly unnecessary. Hydro One in Hanover Ontario, is spraying Garlon under their hydro wires to inhibit the growth of the tree stump suckers. I wanted to know about Garlon, and this site explains a lot. Thanks! and throat and lung problems. She was not told to avoid contact and moved some of the wood left on her back lawn by the utility company who cut the tree down so it wouldn’t obstruct wires. Can anyone tell me about a similar experience? The sites do not have much info on the toxicity of this chemical. Beverly, I hope your sister is okay. Different people have different levels of susceptibility to chemicals. Some people aren’t much affected, others can have a reaction even to tiny amounts. This is one reason we’re so opposed to the casual use of pesticides on public lands. my husband was cutting wood that hydro had left after spraying this chemical. Within a week he was hospitalized with breathing problems, within a month he had to have a defibilator installed and his heart function was at 3 %…..doctors can not understand how fast the heart failed…. Webmaster: Tammy, so sorry this happened to him. Sometimes, people can have chemical sensitivities without knowing about them.